Notice: Election-related material is not available on this website. Such material may be found on party political websites. DST is a national leader in safeguarding Australia by delivering valued scientific advice and innovative solutions for Defence and national security. Our many roles can be categorised as 'core', 'extended core' and 'supporting', as outlined in the diagram and table on this page. See our value proposition for examples of how we provide value for Defence in these roles. 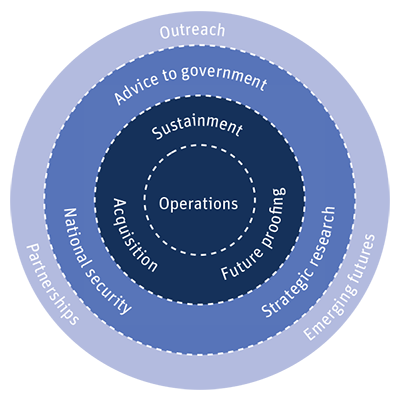 Our core roles are centred around providing expert and impartial advice and support for the conduct of operations, for the current force and for acquisition of future Defence capabilities. These core roles are complemented by a focus on future Defence capability and an outward-facing stance for DST. This includes our role in knowledge and innovation integration, through our partnerships and through our whole-of-government role in coordinating science and technology for national security. Our Strategic Plan 2013-2018 identifies our commitment to continue as a valued adviser to government, and to focus our efforts towards future Defence and national security by being a collaborative partner and an innovation integrator. CORE Operations Supporting operational capability with science and technology expertise. Sustainment Providing support to Defence to sustain and enhance current capability. Acquisition Providing support throughout the genesis, development, acquisition and introduction to service of major capability projects. Future proofing Investigating client-focussed future concepts, contexts and capability. EXTENDED CORE Advice to government Shaping defence and national security strategic policy through expert and impartial advice. National security Leading and coordination and delivery of science and technology to enhance whole-of-government national security. Strategic research Conducting research into high-impact areas for future Defence capability. SUPPORTING Emerging futures Scanning the environment to gain an understanding of emerging science and technology threats and opportunities. Partnerships Enhancing our impact by collaborating with research and industry partners, nationally and globally. Outreach Promoting defence science and education in the broader Australian community.